It’s always nice when somebody agrees with you. The Porsche 968 Club Sport was one of the best-handling cars I ever drove. Last week Autocar concurred. 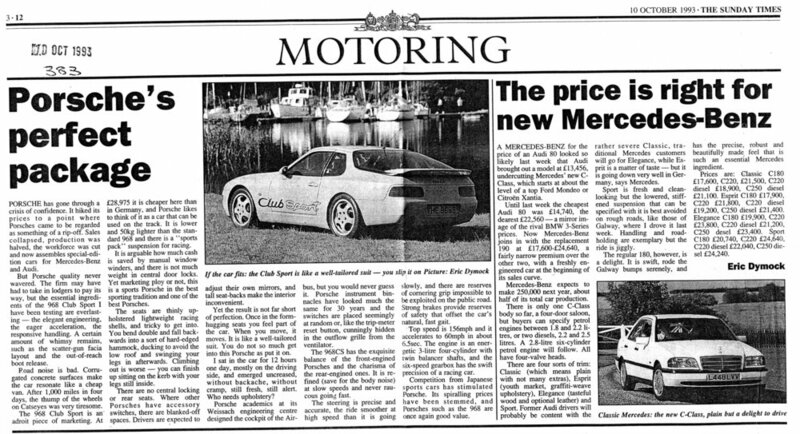 Deciding that 1994 was a high point in automotive history it tested Honda NSX, Ferrari F355, TVR, Peugeot and Porsche, selecting the same exemplary virtues of the 968 Club Sport I discovered in October 1993. It was a pity Autocar chose a slothful automatic Honda; a manual one would have been more of a match for the Porsche. I remain unconvinced about the TVR or even the Ferrari but no Porsche with the engine at the wrong end ever had the exquisite equilibrium of the 968. MG was great at celebrating. On 27 May 1971 George Turnbull, Austin Rover MD saw this Blaze GT off the line. It was given away as a National Sweepstake prize in America the following September. Posed alongside Old Number One, Cecil Kimber’s pioneer trials car of 1925 the MGB went on to half a million, but nine years later the factory was shut. British Leyland thought sports cars passé. Mazda decided otherwise and on 22 April 2016 broke its own Guinness World Record with its millionth MX-5. Its newest goes on sale in September. Classics do survive. MG Classics book 3. McLaren hasn’t won a Grand Prix for six years. Vandoorne was a lap down in twelfth and Alonso didn’t finish at Monza. 1968 was the year of Bruce McLaren’s first win in his own new McLaren car, at Spa. My race report is a 50th anniversary tribute to one of Formula 1 racing’s best men. Pin-ups were a bit naff. Trendy people tried to make statements through books or pictures of a different sort. I liked precise, geometrical framed prints with an engineering quality. No perspective, just careful detailing and exactitude. Hugh Evelyn prints I thought masterpieces. Beautifully reproduced, I used one in our MG Classics Book 2 1945-1965 to illustrate the transition from the TB of the 1930s to TC with which production resumed in October 1945. The best MG for picnicking with the dog was probably the post 1931 Magna. At the time Cecil Kimber’s ambitions to challenge Bentley were flagging. The big 18/80 wasn’t selling and in only its second year the Midget was still a bit of a gamble. Kimber had to find something in between and Morris Engines was making a dinky little 6-cylinder for Wolseley that he could squeeze into a Midget. He didn’t much like the connection with staid old Wolseley so the cylinder dimensions were faked and steel plates fixed on the crankcase to cover it up. Tags The Latest from Eric's Blog, The Autocar, Cecil Kimber, Wolseley, Alan Fearnley. Available digitally or as paperback, MG Classics Book 2 details post-war decades of Britain’s best-loved sports car. A comprehensive account of every model, specs, performance and prices, MG history, racing and record-breaking. Reference material and a good read,authentic, accurate, perfect for MG owners, fans, historians. In 1904 Wolseley took over a design by John Davenport Siddeley (1866-1953) and Austin departed in a huff to make cars on his own account. Wolseley flourished under Vickers and Morris-Nuffield ownership into a classic middle-class car sold under the slogan “Buy Wisely, Buy Wolseley”. Over the years we had several of a series that remained firmly comfortably middle-of-the road until the 1970s, languishing locked into the fatal grip of British Leyland. Maybe a tithe or two of Her Majesty’s revenue was filched by Queen Elizabeth the first’s Lord High Treasurer. Besides being the Queen’s principal fixer he was building Burghley House, round which Rolls-Royce Enthusiasts rallied. Half a century ago this week. Autocar. The year Jim Clark died. Track testing at Oulton Park. Here it is again unabridged. Blog Eric Dymock,.